The number of new hangar clients is increasing rapidly for DC Aviation Al-Futtaim (DCAF), a joint venture of Germany’s DC Aviation Group and UAE-based Al-Futtaim Group. 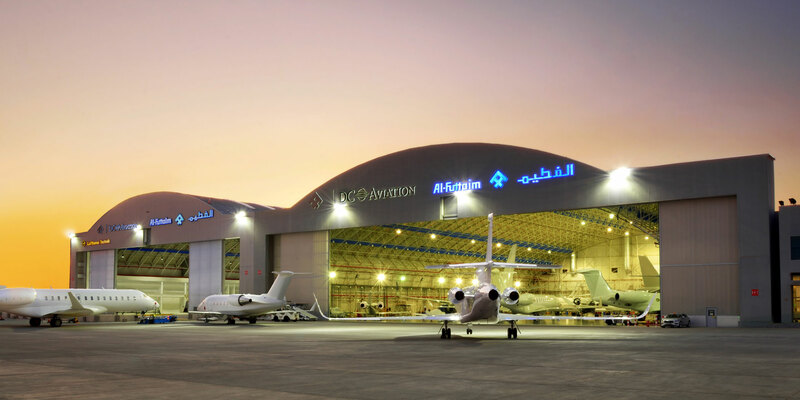 DWC-based FBO and MRO operator DC Aviation Al-Futtaim (DCAF) remains cautious on the regional outlook in Dubai and the surrounding region, as the arrival of a second hangar at its DWC site has boosted its MRO offering, and charter clients benefit from the full Europe-based DC Aviation Group fleet. “We continue to be optimistic, as we have always been. From day one we knew it wouldn’t be a game that was going to be won in the short run. We are progressing steadily, but not in double-digits. We continue to receive interest from owners and operators for our aircraft management and handling services, which shows that we are on the right track,” managing director Holger Ostheimer, told AIN. DCAF, a joint venture of Germany-based DC Aviation Group and the UAE's Al-Futtaim Group, was the first ground handler to set up an FBO-MRO facility at DWC in 2013. Parent DC Aviation Group and Lufthansa Technik signed an international cooperation agreement in 2016, aimed in the UAE at enhancing the MRO services offered by DCAF at DWC. The opening of DCAF’s second hangar late last year has given the company additional options to serve the regional industry. “We are seeing good development. It’s very much in our hands to develop things. We have managed to provide space for new hangar clients and we hope to see this continue. We have had an overwhelming demand in recent months, so that the number of new hangar clients is steadily increasing,” he said. According to the UAE’s General Civil Aviation Authority (GCAA), airspace restructuring is constantly being reviewed. “Air Navigation Service Provision (ANSP) is structured along standard ICAO Standards and Recommended Practices (SARPs). Responsibilities include airspace management and the provision of safe and efficient air navigation services to the users of the UAE airspace,” it said. DCAF now has a managed fleet of six aircraft, after adding a Challenger 605 last year to the roster, which also includes two Globals, three Challengers, and a Falcon 7X. Ostheimer explained that, for DCAF, converting managed aircraft clients to full-service MRO adopters was the preferred method of client acquisition. “[Y]ou will probably start with an aircraft management relationship, sometimes of lower complexity. A hangar client becomes an aircraft maintenance client subject to already providing cover. Or you bring somebody into management and you make a decision as to whether to expand the MRO capability in the hope of finding more clients that would be interested in MRO services on a specific aircraft type,” he said. As the regional business-jet fleet sees new OEM aircraft types enter the market, the process for obtaining the relevant official MRO accreditations must be observed and has to go through the GCAA. “You need to prove that you have a client and that you have got experience. You don’t have to get this experience in your own organization, as you can bring in third-party engineers. With trained and certified staff in place, whether in-house or third-party, the owner will turn to the regulators to furnish relevant approvals,” he said. DCAF is able to provide charter capacity to local or international clients in Dubai by sourcing aircraft from the DC Aviation Group’s European fleet, and offers aircraft ranging from the Learjet 40 to the ACJ319. “The fleet composition of the DC Aviation Group encompasses six different AOCs: two AOCs in Germany, for fixed-wing and rotary, fixed-wing and rotor in Switzerland, a fixed-wing AOC in Malta and a fixed-wing AOC here in the UAE,” he said.